The Idea Builder – Dremel Releases a Mass-Market 3D Printer in Partnership with Chinese Manufacturer Flashforge #3DThursday #3DPrinting « Adafruit Industries – Makers, hackers, artists, designers and engineers! …The Idea Builder, announced today at MakerCon in New York City, is the first 3D printer to be released by a major tool manufacturer, and represents further maturation of at-home additive manufacturing. With initial sales being handled by traditional tool-sales outlets Home Depot, Amazon, and Canadian Tire, it promises to help expose 3D printing to a new range of users. 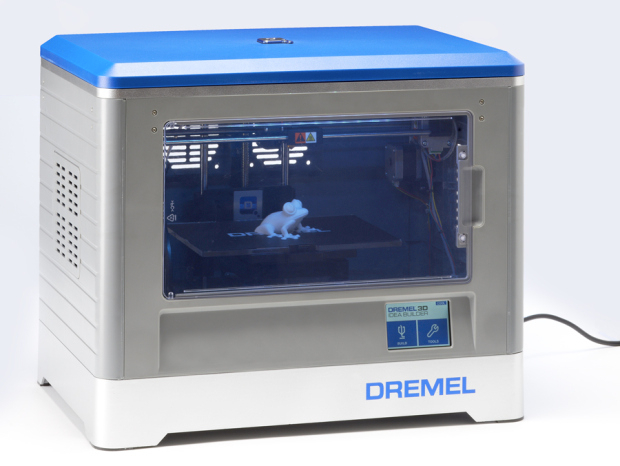 …Dremel has a long history of working with partners around the world to manufacture their tools and products, so it’s no surprise that the Idea Builder was conceived in partnership with Chinese manufacturer Flashforge, makers of the popular “Creator” Replicator clones. The Idea Builder is based on the Flashforge Dreamer, whose electronics utilize the ARM Contex-M4 CPU processor, instead of the ATmega chips used in the Flashforge Creator line. The company is also working with Autodesk to create design software options for their customers. …With Dremel’s entry into 3D printing, it’s clear that the race to mainstream 3D printing is heating up. The Idea Builder’s attractive price point and features make it worth considering for a variety of user types. So how did this machine perform in our serious testing? We’ll be posting our full review in the next issue of Make: magazine, along with 25 other new 3D printers. And look for the release of our test models later this week so you can play along at home.